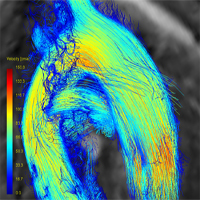 Phase-contrast magnetic resonance imaging (PC-MRI) allows acquisition of blood flow velocity in an non-invasive way. Like other MRI techniques the PC-MRI signal is degraded by noise. The goal of this project was to investigate a new noise reduction processing, which reduces artefacts in an efficient way. Blood flow is incompressible and can be approximated as a divergence-free vector field. Based on this model, we constructed divergence-free tight wavelet frames, and we applied them to the denoising problem. The divergence-free tight wavelets were constructed by applying a projection operator to a standard tight wavelet frame. In our experiments, we demonstrated that divergence-free tight frames could outperform the standard tight frames.